the mental process of knowing, including attention, remembering, reasoning, understanding, intuition, awareness, and perception. 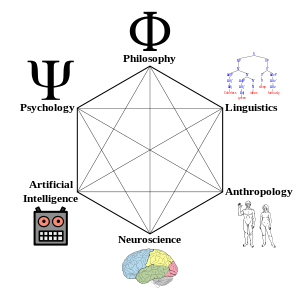 Cognition is studied in cognitive science and various disciplines such as linguistics, neuroscience, psychology, philosophy, anthropology and artificial intelligence  . Cognitive psychology, coined by Ulric Neisser in 1967 , is the study of how people or intelligent agents perceive, recall, learn, think, speak, and solve problems. In 1946, Adriaan de Groot conducted a number of ground-breaking experiments in the cognitive processes that occur in the brains of strong chess players, and defined four stages of the thought process. Perception in Chess was researched by Herbert Simon, William Chase, Ivan Bratko, Peter Tancig, Simona Tancig, Fernand Gobet, Peter Jansen and others, related to chess and computer chess, and how computer chess programmers may adopt techniques from human thought processes. WCCC 1986 Video with Adriaan de Groot, experiments by Dieter Steinwender and Frederic Friedel featuring András Adorján et al. Adriaan de Groot (1946). Het denken van den Schaker, een experimenteel-psychologische studie. Ph.D. thesis, University of Amsterdam; N.V. Noord-Hollandse Uitgevers Maatschappij, Amsterdam. Translated with the help of George Baylor, with additions, (in 1965) as Thought and Choice in Chess. Mouton Publishers, The Hague. ISBN 90-279-7914-6. Noam Chomsky (1957). Syntactic Structures. Mouton & Co.
William Chase, Herbert Simon (1973). The Mind’s Eye in Chess. Visual Information Processing: Proceedings of the Eighth Annual Carnegie Psychology Symposium (ed. W. G. Chase), pp. 215-281. Academic Press, New York. Reprinted (1988) in Readings in Cognitive Science (ed. A.M. Collins). Morgan Kaufmann, San Mateo, CA. Fernand Gobet (1998). Chess players’ thinking revisited. Swiss Journal of Psychology, 57, 18-32. Guillermo Campitelli, Fernand Gobet (2007). The role of practice in chess: A longitudinal study. Guillermo Campitelli, Fernand Gobet, Kay Head, Mark Buckley, Amanda Parker (2007). Brain localisation of memory chunks in chessplayers. International Journal of Neuroscience, 117, 1641-1659. This page was last edited on 18 February 2019, at 21:04.